On Tuesday, 17 March, the parish of St Patrick will come alive with activities put together by the Ministry of Social Development and Housing in observation of World Social Work Day. The international theme for 2015 is ‘Promoting the Dignity & Worth of Peoples’, a theme the Ministry plans to incorporate into a week of activities that runs from 10 to 17 March. Among the activities planned are visits and food hamper distributions to different geriatric and child care homes, church service attendance, a family fun day, a panel discussion and a health and information fair. Yvonne Dabreo, Chief Social Development Officer within the Ministry, says expectations are high for this year’s celebrations. “We are hoping that this year will be very impactful, maybe even more impactful than last year.. so we are asking everyone, especially in the St Patrick community to come out,” she said. Mrs Dabreo said a ‘must attend’ event is the Panel Discussion on March 16 at the St Patrick’s Anglican School from 7 pm. She said the topic “Promoting Dignity, the Impact of Social Media on Community” is an issue that is becoming increasingly relevant in all spheres of life. “From some of the interventions that were done in our line of work we realize that there are a lot of social issues and we also realize that the social media is impacting our people greatly… so it is with this regard that we decided to look at the social media; its impact, and ways in which persons can address some of the issues arising from it,” the Chief Social Development Officer said. 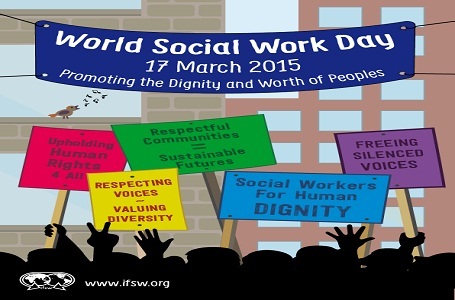 World Social Work Day is the brainchild of the International Federation of Social Work (IFSW), which sees the day as an annual opportunity to celebrate the contribution that social work has made to societies around the world.